Thanks to all the CDMers who came out. We had I think nearly 100 people there through the course of the evening, drawing from CDM, MAKE, Etsy, the NYC blogosphere, and beyond — a whole lot of people were new to this kind of stuff. Welcome! For those of you in other parts of the world, well, we’ll just have to do a world tour. In the meantime, here’s a quick round-up of some of the projects. 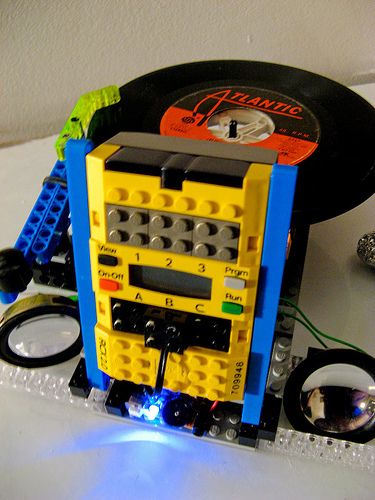 Ranjit Bhatnagar teaches students at Parsons to build alternative instruments and creates his own interactive art and musical gadgets. 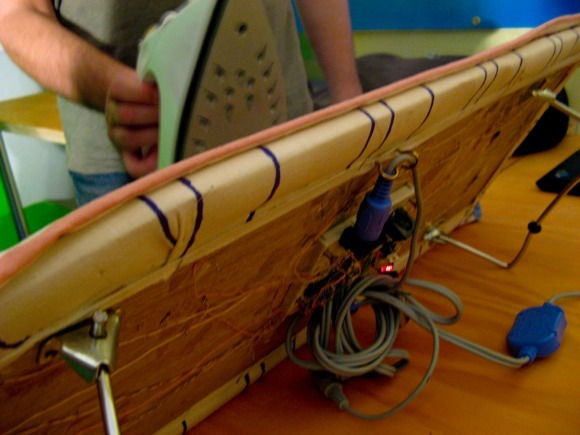 He showed off his MIDI Ironing Board, which controlled interactive music patches using heat sensors. Iron normally, and via Plogue Bidule for data patching magic, your ironing is translated into music. 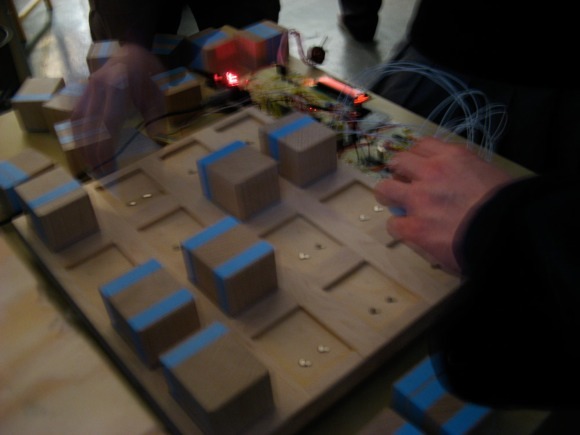 Jeff Hoefs showed his Beat Blocks, co-created with Stijn Schiffeleers and Greg Zifcak, a tangible synthesizer based on striped blocks of wood. It was probably the most popular interactive plaything of the evening, as visitors were fascinated by putting together grooves using objects. Here at CDM, of course, we’re quite accustomed to various variations on the “blocks as musical interface theme”, but this one is quite effective. Eric Singer, founder of the League of Electronic Musical Urban Robots (LEMUR), showed off a number of projects including the gooey tangible interface Slime-o-Tron and an in-progress musical fish (shown here), along with his famed Sonic Banana (basically flex sensors in a tube). What’s especially cool about Eric’s involvement is that he was able to offer a solution for building your own projects, his MidiTron interface. 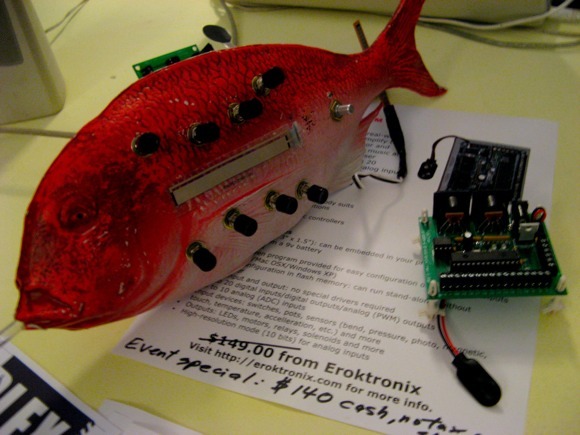 That’s the MidiTron, connected to the fish so it can be used with MIDI. The MidiTron should probably be on your short-list for project-building with sensors, along with the MIDIsense and serial-over-USB (or Bluetooth, or Ethernet) Arduino, as seen on this site and our sister site Create Digital Motion. Eric is also the founder of Lemurplex, a great Brooklyn facility for learning about this stuff. Along with Manhattan’s Harvestworks), New Yorkians have lots of opportunities to take classes without enrolling in a university. We’re of course developing more materials here on CDM which should complement the in-person classes and workshops at various venues internationally. Also seen at the evening: a glove that … um … zaps stuff (never did get to see that in action), a phonograph made out of Lego blocks, a box of virtual fireflies, a GP2X playing glitched-out tracker music. 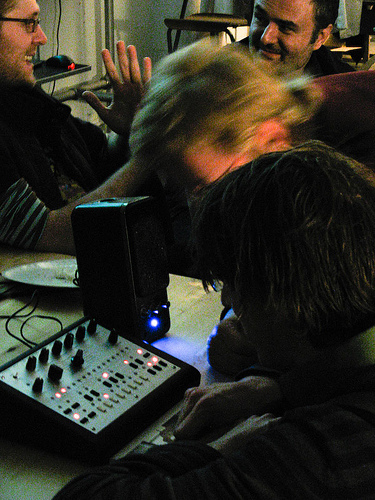 I was representing for software DIY, with a custom synth built in Reaktor, and Jitter patches that converted audio inputs to morphing, blue 3D visualizations and motion into liquid-like video art. (I’ll talk more about those projects and how to build similar patches at a later date, once I’ve polished those project files.) If you were responsible for any of these other projects I didn’t cover — or something else I missed — do get in touch. Drop us a line and let us know if you have a project you’d like to bring to a future date; we’ll definitely have more of these. And if you’re interested in hosting a similar get-together in your neck of the woods, we’d love to hear about that, as well! Amen! And he has a photo of me looking like I’m using my Edirol MIDI keyboard to hack into the defense mainframe, which is a nice bonus. See also his Flickr set, including Phil Torrone with a sonic banana. Eric Skiff captures some of the more grotesque moments of the evening in his Flickr set, including dead conjoined mice (MAKE: Taxidermy?) and gratuitous slime shots. Brilliant work, Eric.